Well, it’s time at last to announce the first paper to be published by the new incarnation of the Open Journal of Astrophysics, which we just published this morning. Here it is! It’s by Syksy Räsänen of the University of Helsinki. 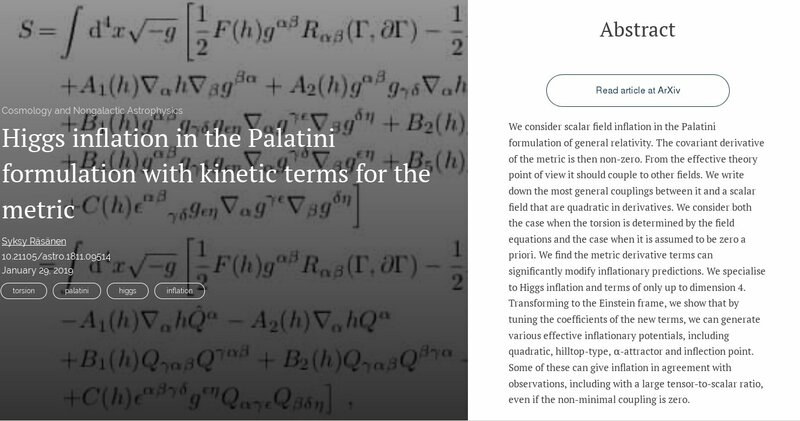 You can find the full article on the arXiv here. This is the first published paper to have been submitted to the Open Journal of Astrophysics since its re-launch last October; the others on the OJA site were published on the old platform and imported into the new site after publication. This new paper has gone all the way through submission, refereeing, revision and publication on the new platform. It’s been quite exciting for the last couple of months, as various papers have been working their way through the Editorial pipeline, to see which would win the race and get published first. Some submissions have been slowed down by folk reluctant to accept reviewing requests, presumably because the journal is not so well known and some are suspicious that it might not be bona fide. Hopefully that will pass with time. Moreover, after internal discussions, the Editorial Board have decided to ask for two referees for each paper by default and that has probably also slowed us down a bit. We have a few other papers coming up for publication soon, and some have been sent back to authors for revise and resubmit. I think I know which one will be published next, but I’ll keep that to myself for now! Which side (of the Einstein equations) are you on? The precise meaning of the terms on the left hand side doesn’t really matter, but basically they describe the curvature of space-time and are derived from the Ricci tensor and the metric tensor ; this is how Einstein’s theory expresses the effect of gravity warping space. On the right hand side we have the energy-momentum tensor (sometimes called the stress tensor) , which describes the distribution of matter and its motion. Einstein’s equations can be summarised in John Archibald Wheeler’s pithy phrase: “Space tells matter how to move; matter tells space how to curve”. in which is the pressure and the density; is the fluid’s 4-velocity. So the cosmological constant now looks like you didn’t modify gravity at all, but created an additional contribution to the pressure and density of the original fluid. In fact, considering the correction terms on their own it is clear that the cosmological constant acts exactly like an additional perfect fluid contribution with . This is just one simple example wherein a modification of the gravitational part of the theory can be made to look like the appearance of a peculiar form of matter. More complicated versions of this idea – most of them entirely speculative – abound in theoretical cosmology. That’s just what cosmologists are like. Over the last few decades cosmology has suffered an invasion by been stimulated and enriched by particle physicists who would like to understand how such a mysterious form of energy might arise in their theories. That at least partly explains why, in one sense at least, modern cosmologists prefer to dress to the right. so for our strange fluid, the second term in brackets vanishes and we have . As the universe expands, normal forms of matter and radiation get diluted, but the energy density of this stuff remains constant. It seems to me to be quite appropriate for a vacuum to something which, no matter how hard you try, you can’t dilute!